Rounded star-like tufts, about the size of a thumbnail, make sphagnum moss easy to recognize. Living sphagnum moss becomes sphagnum peat moss when it dies and partially decomposes. Peat is widely used as a soil conditioner due to its ability to hold water and release minerals to the soil. Mosses aren’t good at capturing our attention, at least during much of the year when they blend into the green landscape, get hidden under brown leaves, or lie buried by white snow. But they’ll catch your eye at the end of April, when we long for the first bits of green. 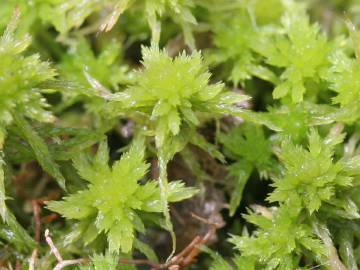 Sphagnum moss is one of the most distinctive mosses you might see in Westborough. As you walk the woods, you may spot small patches of sphagnum moss (Sphagnum) underfoot in wet spots along the trail, or near the edge of streams, swamps, and ponds, or on tree roots or low mounds in wetlands. Most of us know sphagnum moss in another form – not as living moss but dead, as peat or peat moss. It’s something we use in gardening or growing houseplants to condition the soil and help it hold water. Sphagnum moss is the living plant that produces “peat moss” when dead and partly decomposed. Peat, however, can also contain the partly decayed remains of other plants, such as grasses, sedges, ferns, and others that are buried underwater and decay slowly. There are actually hundreds of kinds, or species, of sphagnum in the world. It grows in wet places, especially in the northern hemisphere. Alaska, Canada, Russia, and Finland are great sources of sphagnum. New England has about 20 species of sphagnum. They come in a variety of colors, from green (especially in shady areas) to brown to orange and red. The sphagnums we find in Westborough are usually green. Sphagnum is well known for its ability to hold water. It can hold up to 25 times its weight in water. It can do this because it has two types of cells, and one type is a large, empty, dead cell. These dead cells fill with water from the surroundings and hold it, like small pails of water. The other type of cell is a smaller, living cell that carries out photosynthesis, making sugars from sunlight, water, and carbon dioxide. Its ability to hold water makes sphagnum peat a valuable addition to many soils. It also made dried sphagnum useful to Native Americans, who used it to diaper babies. Sphagnum is also famous for growing in – and helping to create – bogs. Five to 7 different kinds of sphagnum may grow together in a single bog. Sphagnum can grow in a thick, spongy mat on top of still water. It keeps growing at its top, in the rounded, star-shaped tufts of branches and leaves that you see, and it keeps dying at the bottom of its long stem. In this way, it slowly builds up a thick mat over the years. The lower portions of the sphagnum moss die and get compressed, eventually becoming peat. It takes about 100 years for 1-3 inches of peat to build up. In Westborough, we have scattered patches of sphagnum moss in many wet places, but the closest thing to a bog is a boggy area in a slight bay on the northern shore of Cedar Swamp Pond. Few of us get to see it. A short trail from the railroad tracks leads into this area, but the trail is so swampy that you can’t walk it most of the year, except in winter when the area is frozen. Cedar swamps, including ours in Westborough, are good places to find sphagnum moss and other bog plants. Besides holding water, sphagnum also takes up minerals from the environment and in return gives up hydrogen, which serves to acidify the water. The acidity prevents many bacteria and fungi from growing, so it slows or prevents decay. In this way, the dead sphagnum is preserved and buried over time, complete with the minerals it has absorbed. This process also makes sphagnum peat a good fertilizer because it slowly releases minerals when it is mixed with soil. In times past, this ability to prevent bacteria and fungi from growing made dried sphagnum useful as a dressing for wounds suffered on the battlefield. It was put to this use in World War I (in the era before modern antibiotics such as penicillin, which was discovered in 1928 but not mass-produced until 1943) and even as recently as World War II. The smallest salamander in Massachusetts, the four-toed salamander lays its eggs inside mounds of sphagnum moss, where the female guards them until they hatch. This salamander is only 2 - 3-1/2 inches long and has four toes (instead of five like other salamanders). Its back is reddish-brown, and its underside is white with black flecks. It has a constriction at the base of its tail, where it can let go of its tail if attacked. The acidity of peat halts decay and made northern European bogs favored places for burials in the Iron Age (500 BC – 800 AD). Modern-day scientists study the well-preserved bodies that have been discovered in these bogs. The thick layers of peat in bogs also preserve plant material and pollen, enabling today’s scientists to study the plants and climatic conditions of the distant past. In countries such as Ireland, Scotland, Finland, and Russia, to name a few, peat has traditionally been used as fuel. In these places, it was cut, dried, and burned for heat and other uses for centuries. In Scotland today the barley malts used in making Scotch whiskey are often dried over peat fires, which lend a distinctive smoky flavor to the finished product. Living sphagnum moss is the breeding ground for the smallest salamander in Massachusetts, the four-toed salamander (Hemidactylium scutatum). Female four-toed salamanders lay their eggs in low mounds, or hummocks, of sphagnum moss that are near or overhanging water. The female guards the eggs for about 5 weeks until they hatch. Once they hatch, the salamander larvae – an immature form with gills – wiggle into the water where they mature for about 6 weeks, unharmed by the water’s acidity. The adult salamanders spend most of the year in the woods surrounding wetlands that contain sphagnum. Wood frogs and spring peepers can also be found in bogs and other wetlands with sphagnum. They can apparently tolerate the acidity of these waters. Most of the time, sphagnum moss spreads vegetatively by fragments, but it also produces spores somewhat irregularly. The spores develop in small black capsules that you might notice in summer. You might also hear a popping sound when the capsules release the spores. After you first notice sphagnum, you’ll probably spot it again and again. Enjoy finding this ancient and useful moss in our woods.